Welcome to the Rocky Mountain Pipe Band website! Rocky Mountain – 2017 North American Pipe Band Champions! 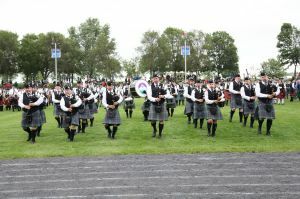 The Rocky Mountain Pipe Band (RMPB) has established itself as one of the premier pipe bands in Western Canada. in recent years, the RMPB has won the North American Pipe Band Championship (2017), the BC Indoor Annual Gathering (2017, 2018), the Mid-America Championship in Chicago, USA (2018), consecutive Alberta Provincial Championships, (2014-2018), multiple Northern Canadian Championships, and many other top prizes at local Highland Games throughout Western Canada. Formed in 1998 and based in Calgary, AB, the RMPB is a Grade 2 band comprised of some of the most talented and skilled musicians in the province. Current RMPB members have won Provincial, Canadian, North American and even World Championships at the Grade 1 level. The band wears the distinctive Isle of Skye tartan, and is under the leadership of Pipe-Major Sean Somers and Lead-Drummer Trevor McKay.